In 1966, Dr. Martin Luther King, Jr. moved the movement up North, to Chicago. In an effort to show his support for the poor, Dr. King moved his family into this North Lawndale apartment amidst the West Side slums. Partnering with the Coordinating Council of Community Organizations, the SCLC discovered that housing requests from economically equal families were being processed in accordance to race. Numerous marches were organized to fight this practice, and they were all met with violence. Dr. King received a constant stream of death threats; he was struck by a brick during one march. Despite staring personal danger in the eye, Dr, King continued to lead the movement, eventually getting the Chicago Real Estate board and protesters on the same page. Upon his return to the South, Dr. King left a young Jesse Jackson in charge of the Chicago efforts. 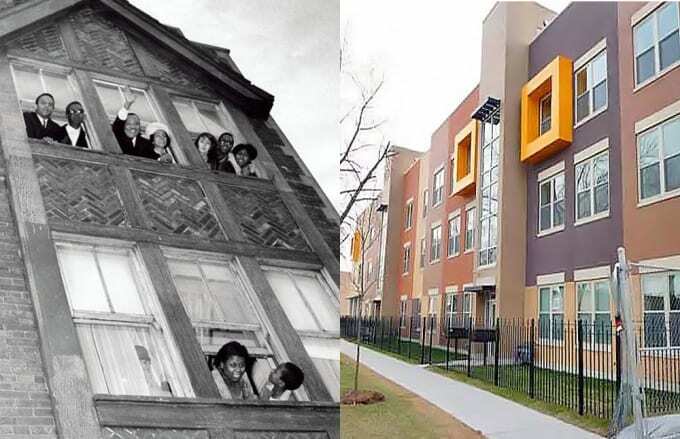 45 years after King's monumental stay in Chicago, the Dr. King Legacy Apartments were built in honor of the only place in the North that he lived.